Peppermint essential oil gives a cooling sensation and has a calming effect on the body, which can relieve sore muscles when used topically. It also has antimicrobial properties so it can help freshen bad breath and soothe digestive issues. Peppermint essential oil is another oil that has been used for centuries by many ancient cultures. It also helps the respiratory system and circulation, and is an anti-inflammatory and an antiseptic. Peppermint even keeps mice, fleas and ants away! Analgesic, antiseptic, antispasmodic, cephalic, digestive, expectorant, astringent, febrifuge, emmenagogue, nervine. Traditionally used for stomach upsets. 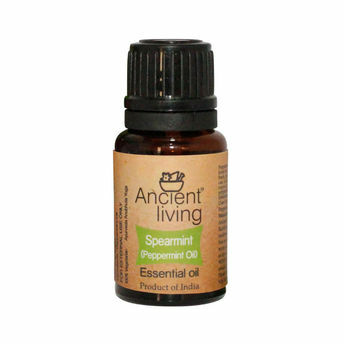 It has an anti-spasmodic action which makes it helpful with colic, indigestion, diarrhoea, vomiting and stomach pain. Dilute well and use as an aromatherapy massage over the stomach and abdomen in a clockwise direction. Drinking peppermint tea also helps! Helps relieve nausea so can be used for sea and travel sickness. It is warming and stimulating and valuable for helping colds, flu and fevers. Cold compresses of peppermint (blended with lavender) on the temples and forehead can help relieve headaches. Can sometimes help with migraine. Use as a steam inhalation for clearing your nose and sinuses. Soothing and cooling for tired feet. It also makes a refreshing bath oil for cooling down your body in the summer. Rats, mice and insects do not like the strong smell of peppermint. Sprinkle some drops along their runs and they will disappear! Also good as a mosquito deterrent. Its mild antiseptic action helps control the bacteria on the surface of the skin and helps with acne.